From bell tents to luxury treehouses, we explain what glamping really is and why a glamping getaway might be the perfect holiday for you. Derived from the words ‘glamorous’ and ‘camping’, glamping is an outdoor escape that combines the closeness to nature associated with camping with the luxury and convenience of proper self-catered accommodation. It is a form of outdoor holidaying that means you don’t need to bring your own tent, sleeping bags and paraphernalia, instead, you can turn up to ready-pitched accommodation that is already kitted out with all the essentials that you need. Though associated with luxury, glamping varies greatly. Some locations may offer every item you could ever need, along with special features like hot tubs, saunas, power showers, massage-parlours, activities and more, while other glamping options will be limited to far more rudimentary accommodation, perhaps with beds, bedding and some basic cooking facilities. As a consequence, glamping is also sometimes called luxury camping or luxe camping. However you choose to describe it, though, the important thing to remember is that it’s fun, convenient and can be the perfect way to ease yourself into the world of camping if you’re a bit nervous about roughing it in the great outdoors. Glamping is an extremely broad term and while many forms of glamping accommodation, such as bell tents and safari tents, have a clear connection with traditional camping under canvas there are many other places to stay that are drastically different from staying in a tent. The main thing, of course, is that, whatever the type of accommodation, to be considered glamping, it should have a genuine connection to the outdoors, and give guests the chance not only to enjoy comforts but also to run wild, climb trees, splash in rivers, star-gaze and have the sort of experiences that we associate with camping. Many forms of glamping accommodation aim to offer year-round, weather-proof places to stay, often aided by electricity, insulation and heating or the use of a wood-burning stove. Wooden glamping pods, for example, are often added to campsites and rented out during the winter months, while cabins are also popular. There is also a trend towards to re-purposing older forms of shelter and transforming them into a modern glamping offering. Mongolian yurts, traditionally used by nomads on the Mongolian Steppe and across Asia, have become a go-to form of glamping accommodation, designed as they are for both hot and cooler weather, while shepherd’s huts, used in England and Wales during the 18th and 19th centuries have also become an up-market form of accommodation. Not every form of glamping accommodation follows the popular designs however. Across the UK and Europe there are hundreds of glamping sites that offer utterly unique, bespoke forms of accommodation that can’t be found elsewhere. During our travels, the team at Cool Camping have discovered wooden spheres suspended from trees, converted double-decker buses, up-cycled shipping containers, old RAF helicopters and fairy-tale treehouses, along with many more options besides. Whatever you’re after, the chances are there’ll be someone out there who has built it. All you need to do is search our website and find your perfect spot. There's less packing: You don't need to own a tent, no need to pack the fold-out chairs, forget the sleeping bags. 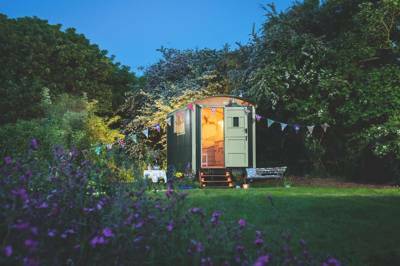 Most glamping sites will provide almost everything that you need, so you can turn up with just a change of clothes and a tooth bursh. Job done. You can sleep in a proper bed: Don't worry about crawling around in a pokey tent and getting a rough nights sleep on a lumpy floor. Glamping means space to stand up, proper beds, real duvets and the chance for a thoroughly deep night's sleep. More time to explore: Less time spent pitching your tent means more time to go exploring. For a short, weekend break, glamping means you don't need to worry about losing time trying to set-up your camp. It's already done for you, so you can focus on the important things, like finding the local pub. It's warmer than camping: Whether it's underfloor heating, electrical radiators or a good old fashioned wood-burning stove, most forms of glamping accommodation will be adapted to keep you cosy and warm whatever the weather. You're never short of space: Unlike staying in a hotel or a B&B, glamping offers children the chance to run wild, climb trees and make the most of the outdoor space. There are less rules and generally a more laid-back atmosphere. If you're going on a family holiday, going glamping beats staying in a hotel every day of the week.